I haven’t written since March 10, and for that I apologize. Even WordPress started nagging me about it! I’m still not working, but working ON it. I have some more gluten-free stuff to share, and I may have a big decision to make soon. But more on that as it happens, since I haven’t been offered anything in the top hiring state in the nation in the 8 months I have been actively looking for a job. Nuffin’. 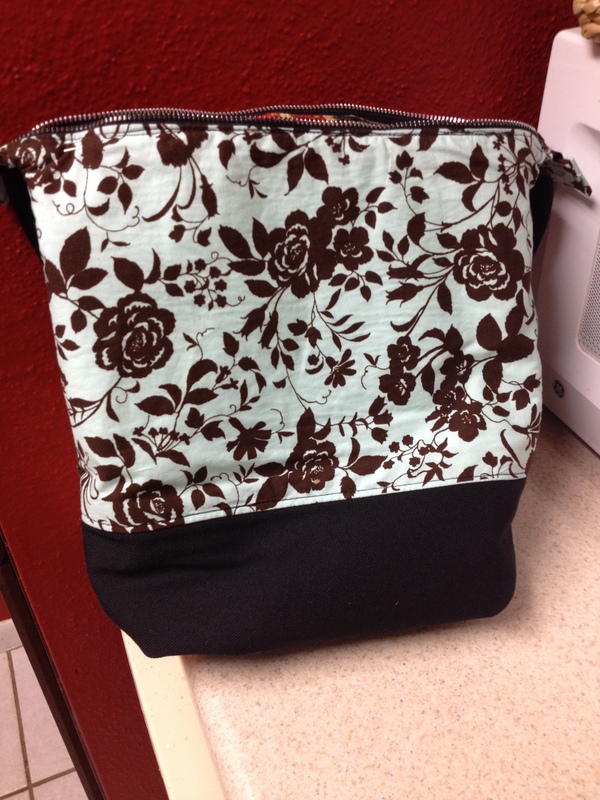 Remember the blog post I did on lunch bags a while back? 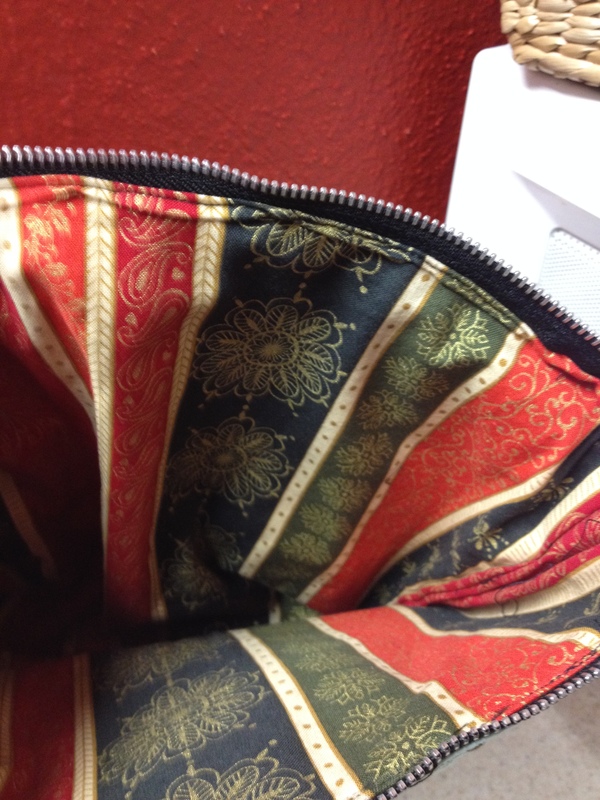 Updates: I’ve got more sewing done, and the last of the lunch bags is complete. I have decided to retire the book Lunch Bags, at least for a while, until I have more inspiration or someone asks for one. 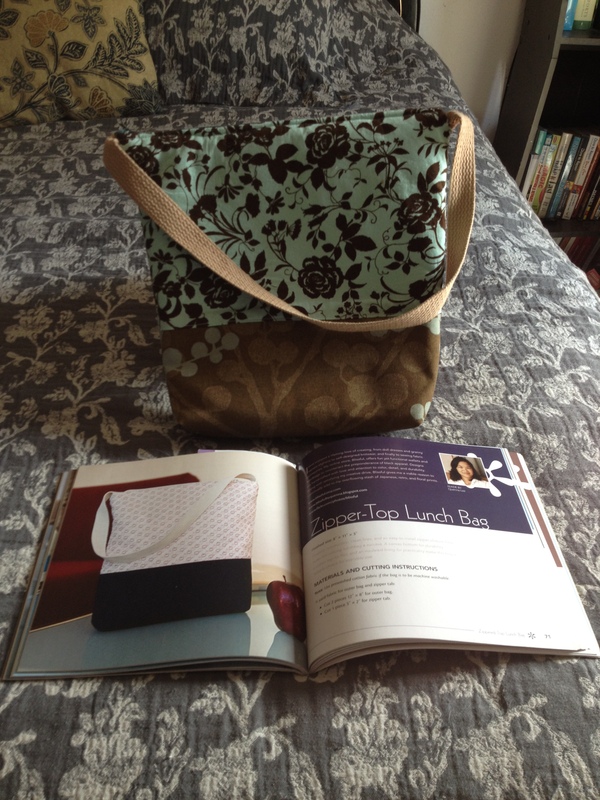 This interesting lunch bag is the reason I bought that darn book in the first place. 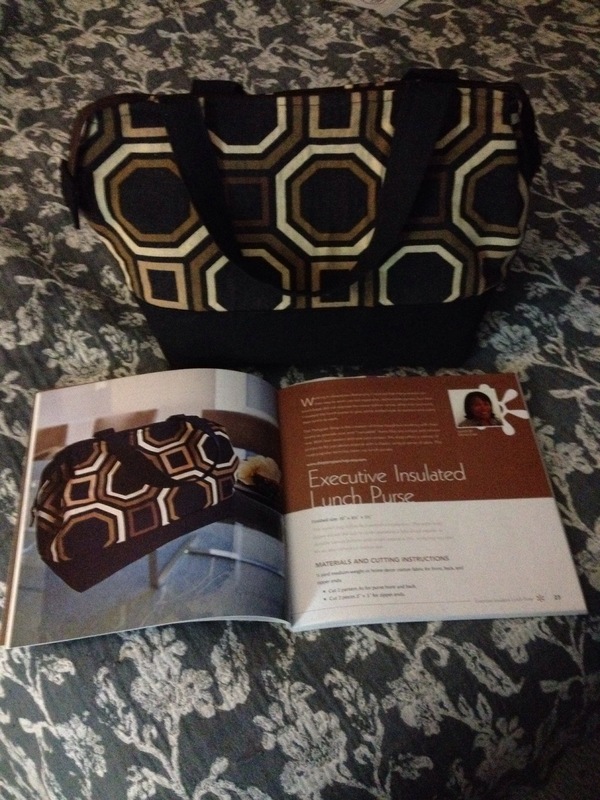 I even found the same fabric used in the book, but kept getting vexed by the directions. Finally, I finished it, more or less just like the book, even though I’m not carrying a lunch bag around anymore. A triumph over. . .oh, heck, it’s finished. And the screaming red liner for lunch bag 3. Told you it was wilder. A note about Insul-Fleece–it won’t keep lunch icy cold for a long period of time, you’ll have to stash the bag in the fridge at work, or at least carry something that won’t spoil easily. I’m not sewing that much, mostly on the weekend. I’ve got a couple of things to stitch up this weekend and I hope I get them all finished on time. OK, now through the bedroom to the HeatCageKitchen garden on the back patio. NOTE: I am NOT making escargot from the snails I keep finding. Yuck. I just toss them over the fence and tell them to go find a new life. So the gardening is, well, it’s going, and if you remember the little tomato survivor, it finally turned red and became part of a garden salad. 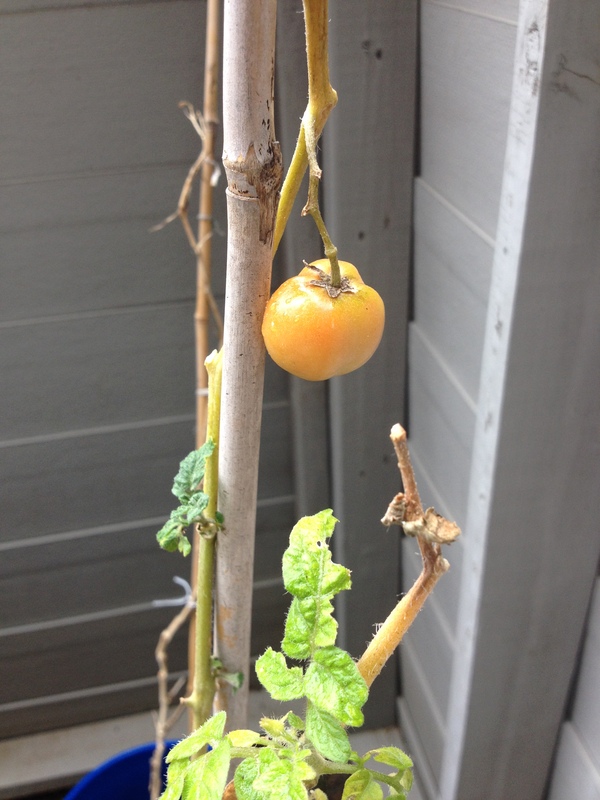 The one, lonely winter-surviving tomato. Incidentally, that plant is starting to come back, as you can see from the greenery at the bottom. Need to trim off the brown parts so the green can thrive. I think I waited a bit too long to use the tomato, because it became a bit, oh, you know, odd, like it was over-ripened, but not too far. Hate to toss that hardy plant after the multiple freezes it went through. I also had my computer in the shop for a few days, and before I picked it up yesterday I ducked into Garden Ridge a couple of doors down. I saw lots of hanging planters for both tomatoes and strawberries, including one that you plant bell peppers on one end and tomatoes on the other. A hanging salsa grower? I’m game. 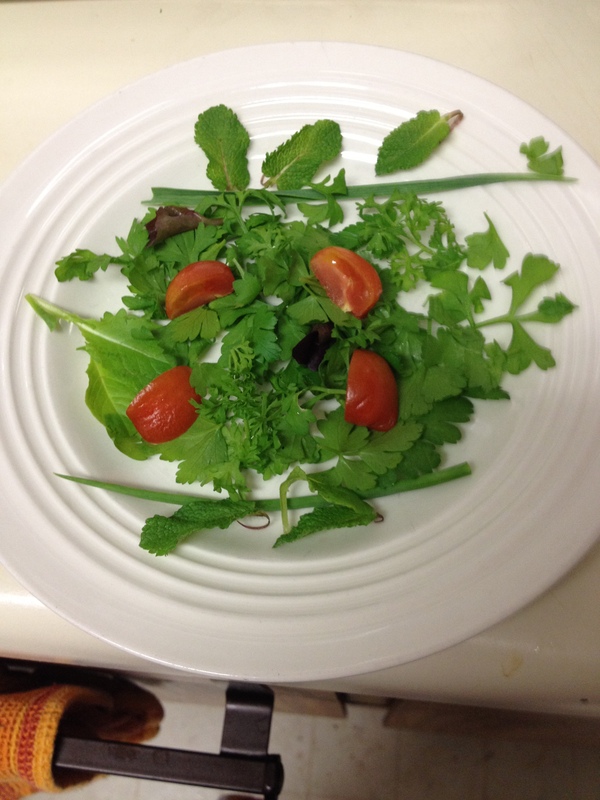 So I gathered up a few ingredients including mint, lettuce, Italian flat-leaf parsley, two garlic shoots, and one hardy tomato and made a gourmet salad. Ready? Here it is. Le Salade a la Amy Garden. You would pay top dollar for this in a snooty restaurant. Those dark colored leaves are lettuce from the “city mix” I planted several months ago. For whatever reason, that was pretty much everything I harvested, and a little has grown back. Oh, boy. 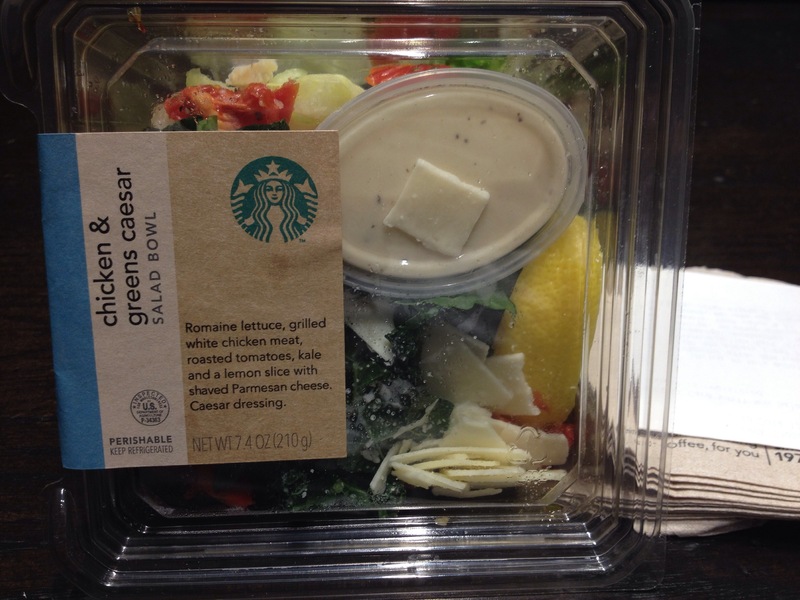 Sure, I put a bit of salt and fresh-mixed dressing on it–who wouldn’t? Of course it was tasty, but I put too many mint leaves in it. Not earth-shattering, just a little potent. Speaking of salads, I have gone back to doing the lettuce-in-a-jar thing after a few months of not doing it, mostly because of the very cold weather. While we didn’t get any snow this time around, not many folks are interested in cool, crisp lettuce when the heater is on and the fireplace is lit. You want warm. . .much as I love salads, this winter, I gave it up for a while. So you probably know my penchant for seeking out stuff on sale, particularly meat on sale, and at SuperTarget, I can definitely get lucky. The steak to start with. No, Fancy Feast was not part of the deal. 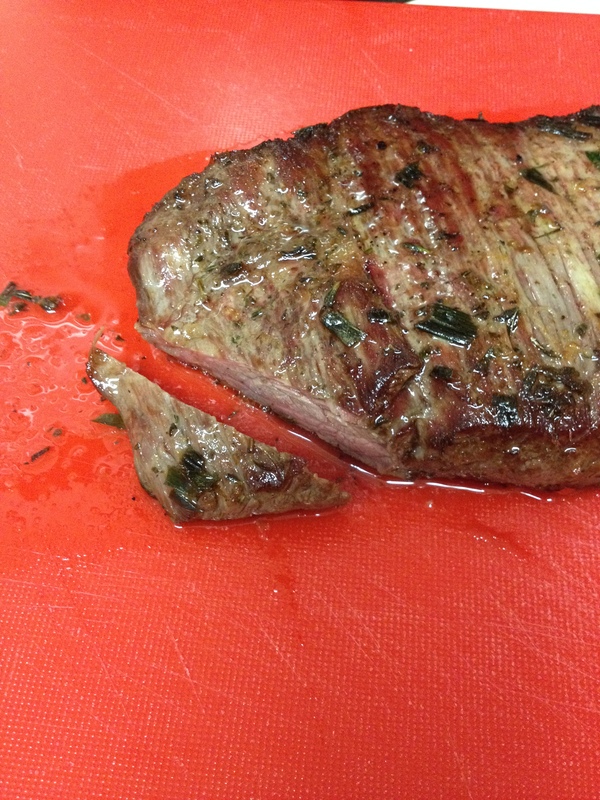 This particular steak was a good flank steak, and the kind that’s organic grass fed and all that. But what to do with it? When I had a “regular” job (that is, one I knew I was going to every day) my favorite single-girl payday meal was a steak salad I created with the usual lettuce/tomato/cucumber, and added either sugar snap peas, avocado, or some other veggie that looked real good that day. My preferred steak was the Flat Iron Steak, which I’d never heard of before but eagerly tried and loved. The dressing is one of my favorites from Suzanne Somers’ Get Skinny On Fabulous Food, (page 149) with six tablespoons of extra-virgin olive oil, two tablespoons lemon juice, two cloves of garlic, and salt with freshly ground black pepper. Whiz that together with your hand blender or mini blender, and set that aside. I discovered flat iron steaks while prowling in Kroger’s meat department one day. They were, at the time, relatively inexpensive, although the price has gone up considerably in the last couple of years. I would get a big one, use my little meat tenderizer tool thingy and get it cooking. Of course I wouldn’t eat the ENTIRE steak at one time; they are usually as long as my forearm. Depending on the size of the steak, I would have one third to one fourth on the salad, and then cut up the rest for more delicious salad later. Sliced thinly and against the grain, the steak and the accompanying salad veggies are wonderful together with that simple vinaigrette. Yum. I need to make that dressing again soon. Shaking oil & vinegar in a jar is easy, but that one is fantastic. My method for cooking just about any kind of steak is simple: stash it under the broiler in the toaster oven. Oh, wait, you want to do it on top the stove? 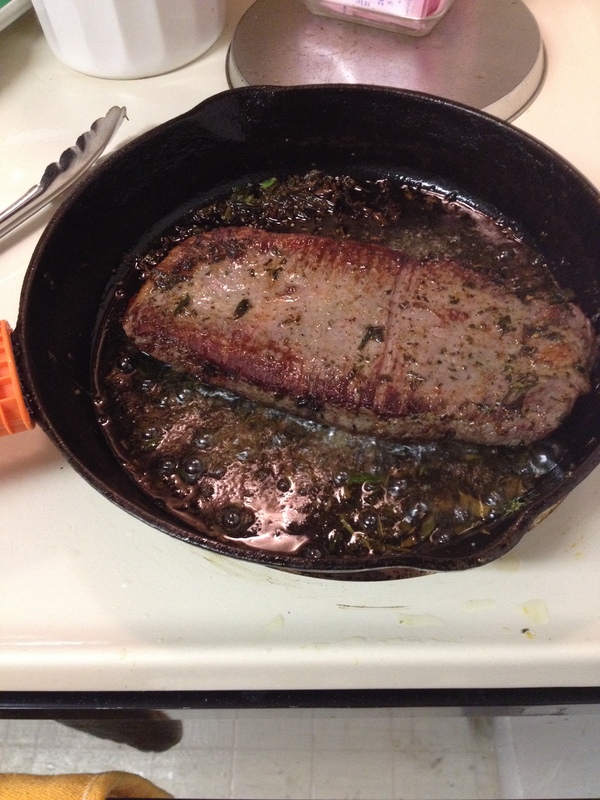 OK, here you go: cast iron pan, a little olive oil, heat on high while you prep your steak (salt/pepper, whatever.) Once you know it’s screaming hot, toss that steak in and IMMEDIATELY turn down the heat to medium. DO NOT go check Facebook because you will ruin a good steak. Do not do that, either. After a few minutes, when you can easily pick up the steak with tongs, a fork or other implement, flip it. Don’t pull or scrape the steak from the pan–if it’s stuck, leave it until it’s not stuck anymore, which shouldn’t be more than a few minutes, like 5 to 7. (You did put oil in the pan, right?) Cook on the second side until it’s done to your liking–red, pink, completely cooked through, whatever. I prefer some red/pink in the middle, because I will microwave the leftovers later and I don’t want to overcook them. Really, you should leave a steak to rest for five minutes before you cut into it. Some of us are impatient, but I do it most of the time. 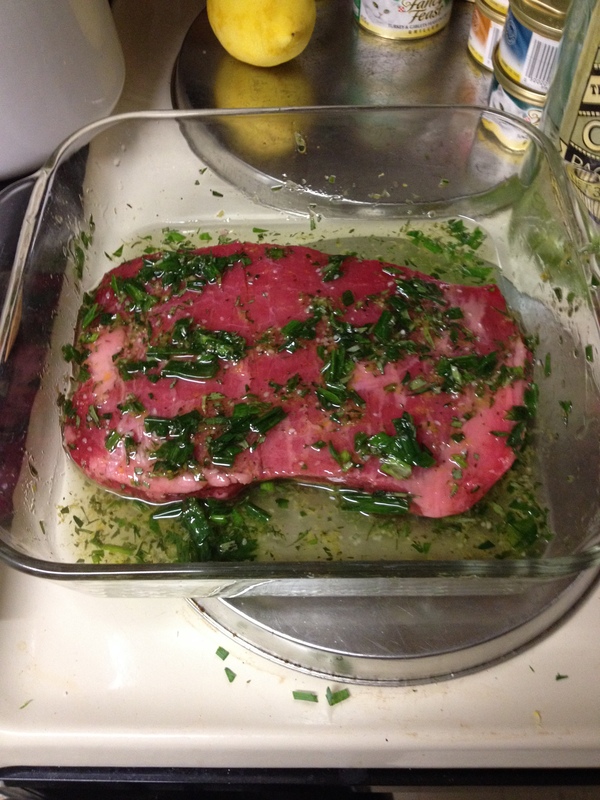 This particular steak I cooked on top of the stove, but because I have more time on my hands than most, I decided to marinate it before hand. Ahh, there’s the rub! 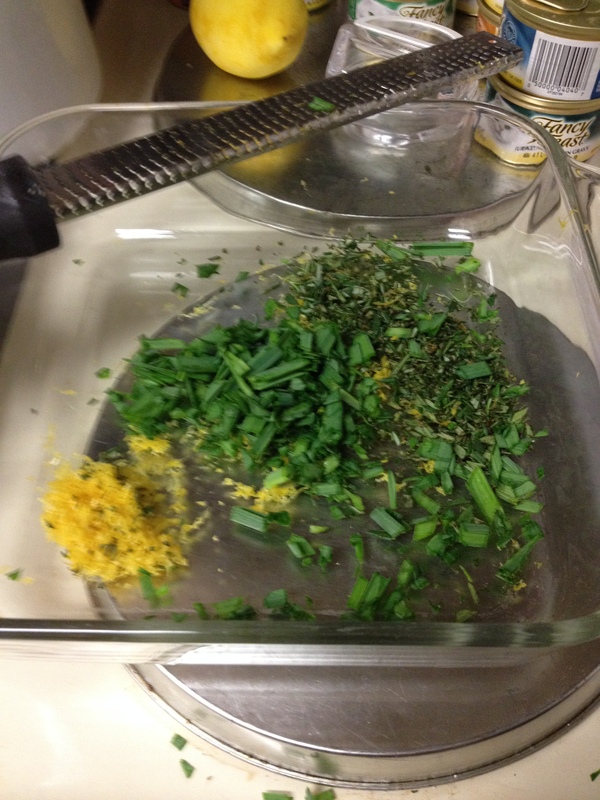 Lemon zest, garlic shoots and finely chopped rosemary from the garden. I’ve said this before, I love the garlic shoots, and if you’ve never tried growing garlic, it’s not difficult. I haven’t yet harvested any, because I don’t think it’s time, but I’ll keep you posted. To the chopped stuff, I tossed in some olive oil–I didn’t measure, but I’d say it was between a quarter cup and an eighth of a cup. Mixed it all together, along with some salt and pepper, dropped the steak in and coated both sides, put some plastic wrap on top and stashed it in the fridge. That’s what a steak is supposed to look like! You could always do this on a grill, too. . .I just didn’t. Feel free to grill and let me know how it turns out, please. It was a good night, and I even had a glass of wine after dinner. With more sewing done and projects given away, it was a pretty good weekend. More to come in upcoming blog posts. 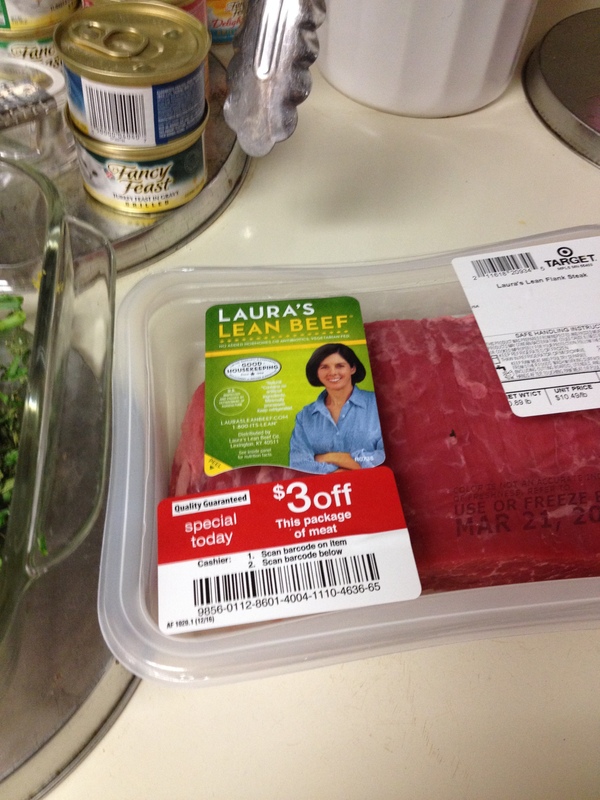 Posted by Amy on March 27, 2014 in Considered opinions, Fast & Easy, Lunch, salad, Tricks of the trade, What's for Dinner?